This is without a doubt my most involved woodworking project yet. While I have built more complex pieces of furniture, this table required a lot of resources to be called on. It started as a request from a good customer, inquiring about having a table built. It's purpose was to be a feature piece in a cabin that they where restoring. 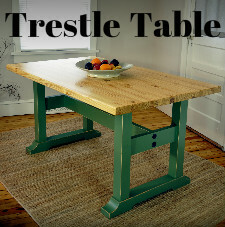 Along with this trestle table, I also crafted a 8 foot farm table and benches as part of the same order. While I had about 4 months to complete the order, I literally sprayed the lacquer finish on the base about an hour before delivery. This table is made from white oak, sourced from a local tree service. The tree yielded 3 nice logs. Lumber was milled from the logs using a band saw mill, with the majority being quarter-sawn. This is a very labor intensive process, even with a fully hydraulic mill. First the log is sliced length wise into four even pieces, like a pie. Then boards are taken off each face of these quarters alternating between faces. This yields some of the most beautiful and stable lumber available with growth rings running straight down the board. It is stable in that it expands and contracts across it's thickness, not it's width which reduces cupping and warping. The lumber for the table top was dried in an electric kiln for about 2 months. While the larger dimension lumber for the base continued to dry, I got started with the table top. I planed the heavy boards with the help of the sawyer and my father in a helical head planer to about 2 inches. The top is so large and heavy that I could not make it in my small basement shop. I ended up renting out space in a warehouse for one week, and boy was it a good idea. For jointing the boards in preparation for gluing them into a 12 by 4 foot slab, I “jointed” their edges with my Festool track saw. To get a perfect cut, I used a brand new blade and it did indeed come out perfect. The table top was first glued up into two halves, then joined into the final slab. For aligning the boards and two halves I used 8mm domino tenons, cutting the mortises with my Festool XL 700 which was specifically purchased for this project. Luckily it has made things much easier and faster in the shop since on a variety of projects. After picking up the lumber for the base, I jointed and planed the lumber with a jointer and planer in the rented space but built the structure in my own shop. I built up the center post of the trestle out of two pieces, this was done to make sure the lumber used would dry faster with less chance of splitting. All the joinery in this piece was fairly simple thanks to my domino joiner. The balance of the joints were traditional mortise and tenons, a saddle joint of sorts and large screws. While simple using the domino joiner, the joinery for this project would have been massively time consuming and complicated if it would have been done totally traditional, I can't say enough about how great an asset XL-700 is in my shop. With all the pieces and parts of the base fabricated, I glued them together using Tightbond 3 wood glue. I used a variety of clamps throughout this project, from quick grips, pipe and band clamps. Thankfully the glue up went smooth. I stained the table using Minwax Jacobean. After staining the base I added bracing to the trestles, this was more decorative than structural, even though it does add a large amount of strength. These pieces where added after staining for ease of assembly and staining. I used large counter sunk wood screws, lubricating the treads with Vaseline. This keeps the screw moving and avoids snapping off the head. Both the base and the table top where finished with M.L. Cambell Pre-Catalyzed Lacquer which dries almost immediately. I sprayed on 3ish coats sanding in between with 220 grit paper. Once fully dry I rubbed out the finish to an even satin sheet with 3M finishing pads. This was quite the project and one that I would question doing again. With that said, it was a great experience and I happy I built the table. The customer was very happy with the table and the fact that they got it in time for the cabins debut. I'll also be producing a series of videos about this project, where I go over in more detail certain aspects of the build. This will be done over several videos posted over the next few weeks. If you have any questions in the meantime, let me know. Thank you all for you time and support. If you have any friends or family you can share the video with, I would greatly appreciate it. Amazon Affiliate Links for Tools and Products used in this video, click for prices and details. Engraving is the cutting of various lines into metal that form decorative patterns. “Hammer and Chisel” is the traditional form of metal engraving done with a small chasing hammer and chisels of various forms. For my personal engraving hammer and chisel handles, I chose to make them myself on a metal lathe. The chisel that goes into the handle is ground by hand from a 1/8 micro grain carbide blank to various shapes depending on the desired cut. In the first video on this post, I do a basic demonstration without explanation just to show the process. I take a “pull” from an engraved firearm by putting black chalk in the cut lines. I then transfer this design with tape to a pull plate that has been waxed so that the chalk adheres. Once the image is in place, I select a tool and begin cutting the main lines, followed up with single point shading and a punched background. Again, this is a simple demonstration and I am by no means an expert. I am still learning the craft of engraving from a seasoned engraver with the goal of doing it both for personal projects and professionally for an additional source of income. In the future I would like to engrave the knives that I am making for a fully executed project as well as engraving jewelry and inlays in wood. Professionally I would engrave firearms for the most part which offers many challenges such as various metal types and uneven surfaces. A selection of hand engraving tools. Hammer and Chisel Hand Engraving is fairly simple as far as equipment goes, you need a hammer, chisels and a way to hold your work piece. My vice is a traditional engravers block, which is a ball shaped vice that you can position freely to make your cuts. There are of course many other accessories that you can gain from such as dividers, sharpening stones, optics and more. The more modern form of engraving uses pneumatic hand pieces and powerful magnification. It is a faster and easier method to learn and quite popular. While both forms of engraving can create beautiful works of art, hammer and chisel is still prized as the traditional form. Thank you for taking the time to view my video and read this short piece. Below are several other videos I have posted on the topic with more to come in the future. Here's some links for engraving tools on Amazon, Associate links help support the channel and website.